The Stumpknocker 184 CC is a boat that’s near and dear to my heart. The simple design makes it the perfect boat for the intermediately skilled angler who is looking for practicality and value. The size and design allow you to fish the inshore creeks and marshes, thanks to its draft, which is between 4 and 6 inches depending on the load weight. It also allows you to venture out to the nearshore ledges and structures when conditions are allowable. All these factors and more, make the Stumpknocker 184 CC a versatile fishing option in a day and age when light tackle boats are laden with expensive and underused bells and whistles. The Interior design offers numerous large storage compartments, which are placed well in both the fore and aft of the boat. This will allow the angler quick and easy access to anything from safety gear to fishing tackle. The large bow and stern casting platforms provide ample room for multiple anglers. 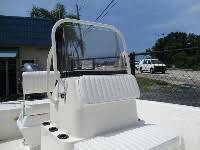 It also comes with a cooler mounted behind the console, complete with a flip-flop seat, enabling the angler to use it for relaxation or for fishing off the stern. 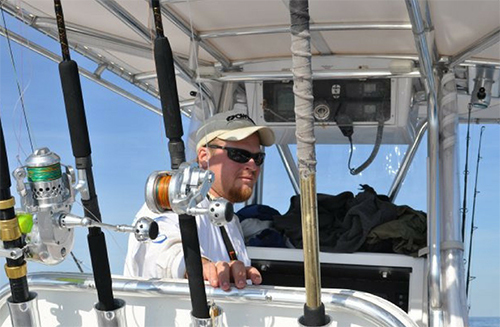 The console itself is a great example of fishing and boat simplicity. With generous grab rails and a decently sized windscreen, it is perfect for the choppier days out on the water. The 90 horse Suzuki engine pushes the boat with ease while eliminating the high cost of upkeep, which comes with larger engines and increased fuel usage, commonly found with other bay boats. What I appreciate most about the Stumpknocker 184 Coastal CC, is the ‘back-to-basics’ design that accommodates nearly all aspects of the inshore fisherman. I also like that it allows anglers the flexibility to customize their boat to meet their needs, and at a much lower cost of other bay and flat boat options on the market. It is quite easy to install customized rod holders and electronics to the console, and the pre-plumbed bait well and pre-wired trolling motor options are just a few examples of the flexibility it offers. Several years ago, I purchased a boat similar to the Stumpknocker 184 CC. It was the best and most enjoyable boat that I have ever owned, and I’ve owned many! I loved the ease of use and durability. It was the perfect size for a day of fishing alone, as well as a day out with a couple of close friends. These are the traits of the Stumpknocker that I find most attractive. I enjoy the fact that the vessel can easily and safely transition to a nearshore boat. With its modified V hull, it’s perfect for the days when the wind lays down and the waters go flat, making you want to poke your nose out to the inlet and see what’s biting. I am also a fan of the rolled gunnel and splatter deck finish. It makes cleaning and maintenance a breeze, which allows more time for the angler to focus on fishing. To me, that is the best feature! The Stumpknocker 184 CC comes with many options that make it easier to modify while still being affordable. This is the kind of boat you will enjoy for years, thanks to its durability and ease of care. It truly is a vessel for the fisherman that likes to focus their free time on fishing rather than the meticulous up-keep of their boat. The price point comes in as the most affordable boat in its class at $24,000, leaving you with extra money to spend on the many customizable options you prefer for your fishing experience. Yopp Brothers Marine (910) 327-2831 or click to visit their website.